CF-XIL in the SRS hangar, at Shannon - EINN, Ireland. CF-XIL at Prestwick - EGPK, Scotland. • 61-423 Royal Norwegian Air Force. Delivered 17-Nov-1961. Initially assigned to Gardermoen Air Base, Oslo. 22-Feb-1962. Assigned to 7193 Stotteving (7193 Support Flight), code 0-AK at Bodø Air Base in northern Norway. 13-Mar-1962. Deployed to USAF base Wiesbaden, Germany. 12-Jun-1962. Returned to unit at Bodø. 01-Jan-1966 assigned to newly formed 719 Squadron at Bodø. Coded XJ-X on 18-Apr-1966. 11Jan-1968 Passed to Vaernes Air Base, Trondheim where it was struck off charge. • CF-XIL Thomas Lamb, The Pas, MB. Regd Apr-1968. • CF-XIL Re titled Lambair from Dec-1968. • CF-XIL A. Fecteau Transport Aérien Ltée, Senneterre, QC. Regd 16-Feb-1972. Accident: Nr the Romaine River, QC 01-Sep-1975.The aircraft was en route from Lac Cormier to Lac Francine, near Havre St. Pierre, QC. It crashed into a hill near the Romaine River due to engine failure. The pilot received serious injuries. A crewman and two passengers were killed. The Otter was destroyed. Otter 423 was delivered to the Royal Norwegian Air Force on 17 November 1961 with serial 61-423, taken from its year of delivery and constructor’s number. The contract price was CAD$134,512 including amphibious floats. The Otter was crated at Downsview and shipped to Norway, arriving in Oslo Harbour 11 December 1961. It was taken to Fornebu Airport, Oslo where it was re-assembled by Widerøes Flyverksted and then accepted by the Air Force on 13 December. Its total time was one hour fifteen minutes, which had been its test flight at Downsview. The Otter was initially assigned to Gardermoen Air Base, Oslo. On 22 February 1962 it was assigned to 7193 Stotteving (7193 Support Flight), code O-AK, and flew north to its new base at Bodø Air Base in northern Norway. It was only there for a few weeks when on 13 March 1962 it left Bodø on amphibious floats for a very long trip indeed. Routing was Bodø-Orland-Oslo (Fornebu)-Skrydstrup-Sylt-Wiesbaden, West Germany where it arrived on 16 March and was immediately put into a hangar and dis-assembled, ready to be air-freighted to the United States. The United States Air Force (USAF) had a programme known as “Big Safari”, a covert operation to modify aircraft for intelligence gathering during the Cold War years. Most of the aircraft modified were USAF’s own aircraft, but occasionally “Big Safari” would modify an aircraft for a foreign government, when the USAF could benefit from the intelligence or to thank the foreign government for its support. In this case the USAF owed a favour to the Norwegian government for its support of clandestine U-2 flights based out of Bodø during 1958 / 1960. They agreed as a quid pro quo to modify Otter 423 for the Norwegians. The contractor to carry out the work was the Special Projects Division of General Dynamics Convair, based at Fort Worth, Texas. The Royal Norwegian Air Force had originally wanted the modifications carried out while the Otter was on the production line at Downsview. The work however was too secret for this to be done, and instead a deal was worked out that “Big Safari” take control of the project after the Otter had been delivered to Norway, and then transport the Otter to Texas. The project was designated CALL 108 and given the programme name “Long Sam”. The logistics of all this became a labyrinth of bureaucracy beyond Big Safari’s previous experience. The State Department had to become involved to assist Big Safari with the legal maze of transporting the Otter to Texas and returning it to Europe. Having arrived at the USAF base at Wiesbaden, the Otter was then flown on board a USAF C-124 Globemaster to Fort Worth, where on 1 April 1962 work started on modifying Otter 423. General Dynamics installed a modified version of the KA-2 camera with a forty inch focal length and a KC-1 mapping camera. This equipment was readily removable and designed to be undetectable when in use on covert operations. The work had been completed by 15 May 1962 after which the Otter was flown back to Wiesbaden and re-assembled. It made a test flight there on 19 May and remained at Wiesbaden for three weeks, taking part in a NATO exercise including night flying. On 12 June 1962 it left Wiesbaden to return home, routing first to Rhein-Main Air Base-Schleswig-Rygge-Oslo (Fornebu)-Bergen-Orland and back to base at Bodø, where it arrived 14 June and re-joined 7193 Support Flight. It would remain based at Bodø with the Flight for the next few years. In January 1964 it returned to the Widerøes maintenance facility at Fornebu for overhaul, after which it returned to Bodø. It again visited Fornebu for overhaul during November / December 1965. On 1 January 1966 719 Squadron was officially established at Bodø, taking over from the Support Flight, all of whose Otters were transferred to the new Squadron, including 423. On 22 December 1966 the Otter made its first flight with its new squadron code of XJ-X. It continued to fly for 719 Squadron at Bodø until 11 January 1968 when it arrived at Vaernes Air Base in company with Otter XJ-T (53-29) and was struck off charge. Otter 423 had flown 1,794 hours in the service of the Royal Norwegian Air Force. It was entrusted to Halle & Peterson, Oslo, the DHC representative in Norway, for sale. 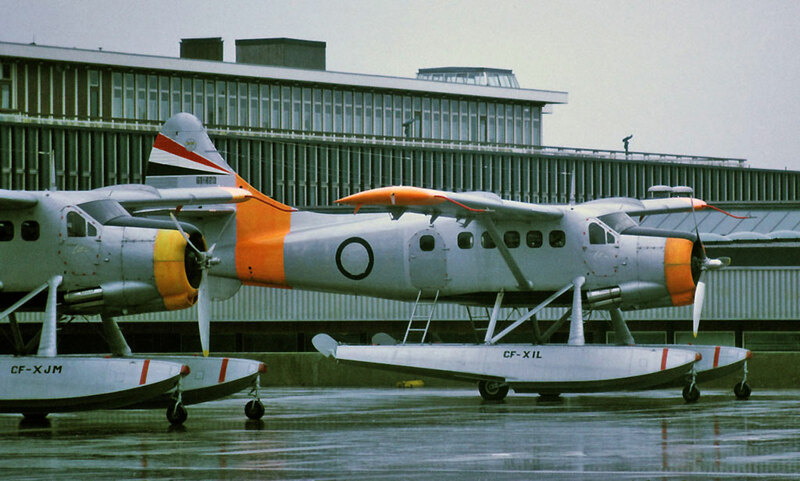 Three of the former Norwegian Air Force Otters were sold to Thomas Lamb Airways Ltd., of The Pas, Manitoba in April 1968, serial 29 which was allocated marks CF-XJM, serial 423 which became CF-XIL and serial 441 which became CF-CDL. The purchase price was $30,000 a piece and at the time of the sale all three Otters were located at Vaernes Air Base, Trondheim on amphibious floats. Thomas Lamb Airways (later re-named Lambair) were responsible for returning many Otters back to Canada from foreign parts and arranged for ferry pilots to fly the three Otters back to Canada. A ferry permit was issued for the delivery flight from Vaernes Air Base, Norway to The Pas, Manitoba. The three Otters set off in formation, flying first to Oslo-Copenhagen-Rotterdam-Soesterberg Air Base-Manchester (parked on the Fairey Aviation ramp) and then on to Shannon in Ireland where they arrived on 25 April 1968. They certainly presented a magnificent spectacle on arrival, still in full Norwegian Air Force scheme of natural metal with day-glo. At Shannon ferry tanks were installed in the Shannon Repair Services hangar. The three Otter formation departed Shannon on 4 May headed north for Prestwick, Scotland, then routing onwards to Stornoway-Reykjavik-Angmagssalik-Julianhab-Goose Bay-Sudbury (Ontario) to The Pas. The flight was reported as uneventful (if crossing 2,500 miles of North Atlantic in an ageing, single-engined aircraft can be considered uneventful) and the three Otters having arrived at The Pas were overhauled and made ready for service. 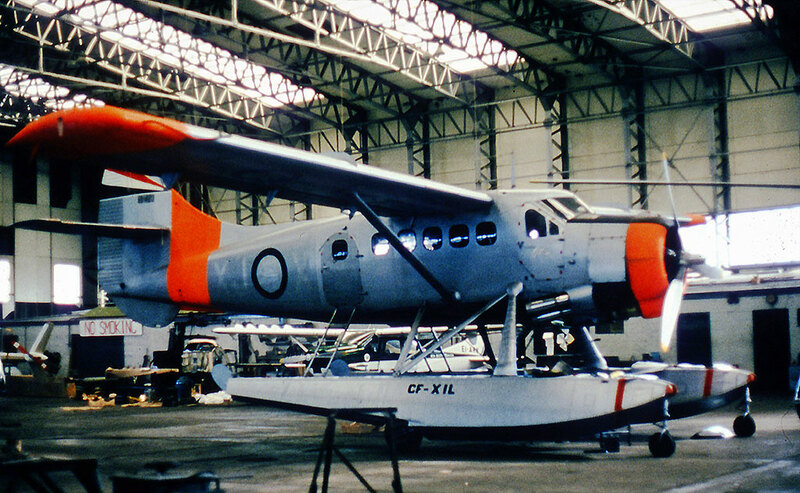 Otter 423 was formally registered to Thomas Lamb Airways on 18 June 1968 as CF-XIL. The Otter flew for Thomas Lamb Airways (named Lambair in December 1968) until sold to A.Fecteau Transport Aerien Ltée of Senneterre, Québec on 16 February 1972, registered to its new owner on 13 March 1972. It continued in service in Québec, one of Fecteau’s large fleet of Otters, until destroyed in a crash on 1 September 1975. The Otter was en route from Lac Cormeir to Lac Francine, near Havre St.Pierre. It crashed into a hill near the Romaine River due to engine failure. The pilot (Frank Kelner) received serious injuries. A crewman and two passengers were killed. The engine quit suddenly while the aircraft was in the cruise and the Otter crashed into trees sixty feet short of the river chosen by the pilot for a forced landing. The Otter was destroyed. Whatever clandestine activities it had undertaken while in military service in Norway with its top secret modifications, it took its secrets to the grave.